Listed for 02-05 100 Series Land Cruisers and 02-05 Lexus LX470. 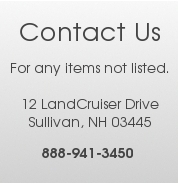 If you have any questions about the item(s) that you may need please feel free to call and we will be glad to help you find what you are looking for. Feel free to call or email the contact information listed below. Price shown is for a Used part. All Remanufactured and New Genuine Toyota Parts have a 1 Year Warranty on them. All Used Parts have a 90 Warranty on them and are guaranteed to be in good working and/or serviceable condition. Some cleaning, sandblasting and painting may be required per visual preference. This product was added to our catalog on Wednesday 27 December, 2017. 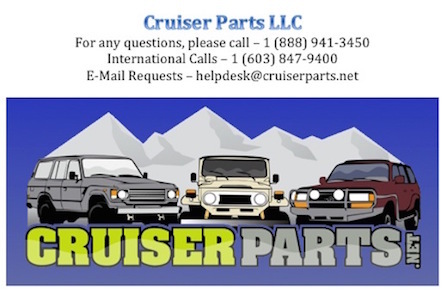 Copyright © 2019 Land Cruiser Parts. Powered by Zen Cart. Zen cart ecommerce designby Picaflor Azul.